What makes a Medallion quilt pop is border upon fun border surrounding an eye-catching center block. It is a quilt where more is really... MORE. Getting those borders to fit just right can be frustrating. Author Erin Burke makes it easy to sew an oh-so-modern medallion quilt starting with the center block and building your own medallion from the center outward. With this book, the best part is that all of your borders will align perfectly. Start with 1 of Erin's 6 creative center block designs or make one of your own. Then add on as many of her 30 pre-measured border variations as you like in any of 3 different widths to create a one-of-a-kind quilt in the size you want. Erin already did the math for you ensuring a perfect fit for every border. If you are not looking to design your own quilt, choose 1 of Erin's 6 ready-to-go medallion projects and all you will have to do to get started is select your fabrics. 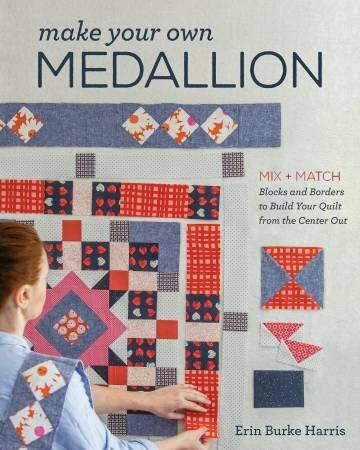 Medallion quilts never go out of style and this book gives you all the tools you need to build fabulous mix-and-match borders from the center out - all of the fun with none of the math.